This is a sponsored conversation written by me on behalf of Georgia Pacific. I’m on a mission to get my kids eating healthier and try new foods. Unfortunately, getting picky eaters to try new foods is no easy task. I add vegetables to smoothies. I bake muffins with veggies. We even add shredded vegetables to lasagna! But, it’s not enough. We still struggle every day to maintain the recommended amount of fruits and vegetables. 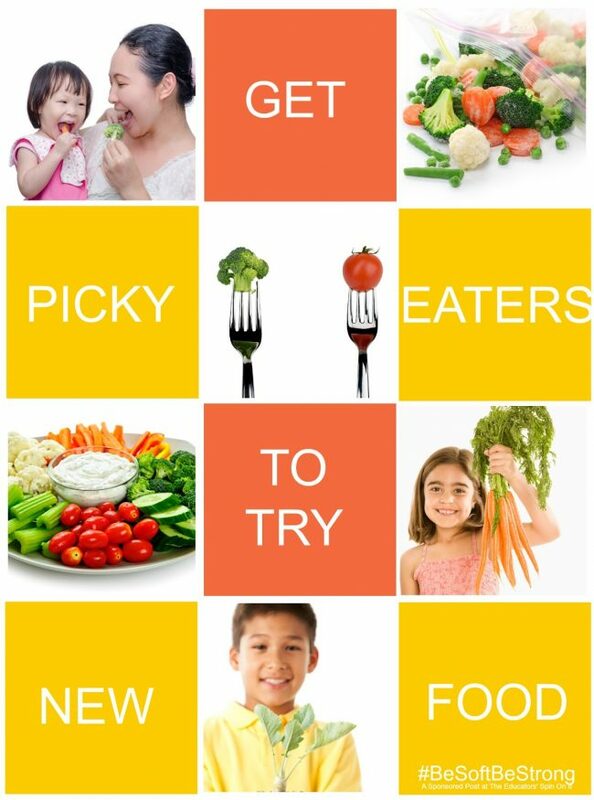 Watch the video with 2 mom tips for getting picky eaters to try new vegetables. Thankfully, I’ve got a great group of mom friends who were willing to share their take on getting picky eaters to try new foods. Not sure when to be soft or strong as a parent? Read on to see how our community of moms gets picky eaters to try new foods. Here are some tips for getting picky eaters to try new foods from Moms around the world. We share a common goal of raising happy, healthy families. We serve veggies frozen and the kids LOVE IT. When my kids grow veggies and fruits (and even herbs) in the garden, they feel so much more connected to the food and proud of what they’ve done. They had never tried figs before, but as soon as our figs were ripe they started picking them and tasting them. There’s something about growing your own food that lures kids out of their pickiness! Be consistent and serve veggies each night and eat them yourself! They’re watching and actions speak louder than words when kids are concerned. As a mom to 5, most often there will be at least one person who doesn’t like something. Since I don’t short order cook, they are required to eat at least a little of the offending food. It’s amazing what repeat exposure will do for growing to like something. Now to help it down the first several times, ranch sauce works wonders in our house. It’s amazing what they’ll eat with it. Give 3 Specific Options – Let them Choose ONE! In situations where our toddler/preschooler doesn’t want to eat anything because she doesn’t like a texture or taste, we give her three defined options. (If they’re already made, we place them all in front of her). She has to eat one of them or the equivalent to one of them if all in front of her. We also have defined what is food and what is a treat. So ice cream, sweets, etc. are treats and we don’t eat them when hungry, but as a supplement when we finish regular food. Casseroles are tempting because they are easy and inexpensive, but kids tend to shun “mixtures.” I know mine do! Besides, you may find that simple, plain foods are actually easier to prepare in the end. Finger foods tend to be a big hit, like sandwiches, vegetables and dip, sliced fruit, and simple pastas are often popular. What do you do about allowance? 2 Moms On Video.